20th Century Fox’s third Cinemascope release after the tremendous successes of The Robe and How to Marry a Millionaire was Robert D. Webb’s Beneath the 12-Mile Reef, a mediocre adventure tale that makes the most of its beautiful and atmospheric Florida location photography and its appealing cast. Plot: Fierce competition among sponge fishermen forces a Greek-American family to fish in the dangerous 12-mile reef area off the western coast of Florida. 20th Century Fox’s third Cinemascope release after the tremendous successes of The Robe and How to Marry a Millionaire was Robert D. Webb’s Beneath the 12-Mile Reef, a mediocre adventure tale that makes the most of its beautiful and atmospheric Florida location photography and its appealing cast. Without the religious epic feel of The Robe or the glittery female superstars of Millionaire, this film had to lure in the customers on its scenic and underwater pleasures alone, and it worked. The film was a hit for Fox in its day (though not surprisingly grossing less than the first two films). Sponge divers Mike Petrakis (Gilbert Roland) and his son Tony (Robert Wagner) have decided that the areas where they dive aren’t yielding the impressive sponges that can be found in other areas of southern Florida. But the Glades area is monopolized by Thomas Rhys (Richard Boone) and his partner Arnold (Peter Graves), a fact brought forth painfully to Mike and Tony when their large haul from the Glades gets confiscated by the Rhys family and Arnold. So, Petrakis decides to dive at the 12-Mile Reef, a dangerous locale known for plentiful and quality sponges but harboring razor-sharp coral, tangles of kelp, and hazardous oceanic life and currents that could easily lead a man to his death. But Mike and Tony are so desperate to make a big score that they’re willing to take the risk. A.I. Bezzerides’ screenplay balances the fascinating and colorful undersea diving sequences with a tedious Romeo and Juliet/love triangle subplot that takes precious time away from the underwater explorations. This gives Robert Wagner as the continually grinning Tony a chance to flirt and fondle Rhys’ daughter played by Terry Moore. Their liaison is chemistry free (Moore was coming off an Oscar nomination the previous year for Come Back, Little Sheba so she gets second billing) and not particularly smoldering enough for the amount of time devoted to it. And the two opposing families, all hot and bothered by jealousy and misunderstandings, end their feud all too quickly for believability. Still, the film’s real substance is found in the diving sequences which, while not featuring the kind of crystal clear imagery found in Esther Williams’ water ballets (hers were mostly filmed in tanks rather than under the waters of Key West) still makes for the film’s best moments. The first dive at the reef is particularly fascinating in its different levels and with an array of marine life that’s continually captivating. The later sequence when Tony does his dive and is attacked by an octopus is so murky that the obvious danger of the situation gets a bit constricted by the viewer’s inability to see things clearly. The basic plot is handled in perfunctory fashion by director Richard Webb, but he does make sure to use that wide expanse of the Cinemascope screen to optimum advantage capturing characters spanning the full width of the picture and shooting scenes in the Everglades with its unusual topography which divert the eye from the banal romantic scenes and predictable jealousies that take place there. Gilbert Roland is the most charismatic actor in the movie, strutting around as the Greek diving king and clearly a man in total control of his family and his business (until regrettably trying to beat the odds with his reef dive). Robert Wagner’s inexperience is painfully obvious in many of the scenes, and Terry Moore isn’t much better, the two of them engaging in initial flirting and then more serious romantic entanglements that just don’t have the ring of truth to them. Peter Graves is rather too stereotypically villainous as Tony’s rival in love and in business, but Richard Boone offers a more balanced performance as the senior Rhys. J. Carrol Naish is a most welcome sight as the elderly friend and partner of the Petrakis family who tries to bring common sense to the table but is frequently ignored. Harry Carey Jr. plays one of Richard Boone’s sons: in reality he was only four years younger than Boone. The film’s 2.55:1 theatrical aspect ratio is faithfully reproduced in this beautiful 1080p transfer (AVC codec) with rich, deep color saturation levels (some of the sunsets are simply breathtaking). Sharpness is all one could wish for as well. Contrast has been applied superbly to provide for consistently impressive image quality. Black levels are nicely rendered, but it’s the lush color that is the real standout in this transfer. The movie has been divided into 24 chapters. The disc obligingly offers two different audio mixes both in DTS-HD Master Audio: 2.0 stereo and 5.1. I listened to half of the movie with the 5.1 default mix and the other half with the stereo mix. Both are impressive and both feature the directionalized dialogue that was notable in early Cinemascope sound mixes. The 2.0 seems to be just a bit stronger in presenting the dialogue more forward from the other parts of the track, but both are most agreeable. Bernard Herrmann’s terrific background score gets a lush presentation in the 5.1 mix. Atmospheric effects are mixed with the other elements with surety in both soundtrack offerings. Isolated Score Track: wonderfully presented in DTS-HD Master Audio 3.0. Robert Wagner: Hollywood’s Prince Charming (44:02, SD): an episode of A&E’s Biography series narrated by Peter Graves (who ironically beats up Wagner on screen in the film and later loses an underwater wrestling match with him). Six-Page Booklet: contains some color stills, original poster art on the back cover, and film historian Julie Kirgo’s fact-based essay on the movie. 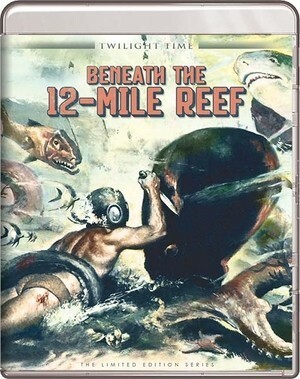 Fox via Twilight Time is offering a magnificent high definition transfer of one of its earliest Cinemascope films with Beneath the 12-Mile Reef. While the dramatic narrative isn’t memorable, the lush color, a magnificent background music score, and the facile use of the widescreen process add interest to this otherwise mediocre melodrama. There are only 3,000 copies of this Blu-ray available. Those interested in purchasing it should go to either www.twilighttimemovies.com or www.screenarchives.com to see if product is still in stock. Information about the movie can also be found via Facebook at www.facebook.com/twilighttimemovies. Why is that screenshot 1.33:1? The film is presented in 2.55:1 on this release, correct? dpippelWhy is that screenshot 1.33:1? The film is presented in 2.55:1 on this release, correct? I got the picture from Google Images. It has nothing whatsoever to do with the transfer on the disc. +1 — great review and good info, Matt! Due to the confusion, I have swapped out the original top art picture with something more fitting. Glad to hear the directional dialog is included. Many of the 1950's Fox films had it. RolandLGlad to hear the directional dialog is included. Many of the 1950's Fox films had it. john a hunterWhere was The Grand? The picture quality on this movie, as the review says, is excellent.